It’s quite amazing to live in the world where you can instantly become famous and also lose your fame within a few seconds. Liliane participated at the European Song Contest many years ago and had to be left satisfied with a second place finish, while the first place was taken by ABBA. Now, for many years she lives an uneventful life until the day when she meets a young man who wants her to restore her singing career. Liliane is a very attractive and beautiful woman who works in pathe factory. The routine of coming to work around 8 A.M. and leave by 5 PM seems to not bother her, while life itself appears to her as ideal. Jean also works in a factory, but considers this job as temporary, while dreaming to become a professional boxer. He even gets a first fight soon that could not possibly have excited him more. One day he sees Liliane in the factory and recognizes her as the back-then infamous singer, whose musical career was cut short due to personal issues. The personal issue was her then-manager and husband, with whom she had to end both personal and professional relationship. Now a grown-up and mature Liliane finds in Jean the love she was desperate for. In her, she sees as an opportunity to grow as a man who can bring back to pedestal the woman he loves. Eventually, his plan works out as Liliane allows him to re-arrange everything required until the past that once again tries to interfere with Liliane’s long awaited appearance on the stage, as well as with her happiness. SOUVENIR is a touching story of woman who struggles in her own way, but does not show it to everyone. Her eagerness to love, to be in love and be loved by the audience is equally strong. Filmmaker’s delicate approach follows Jean as well, a man, who despite being half her age, ignores the gap and fights for his love. 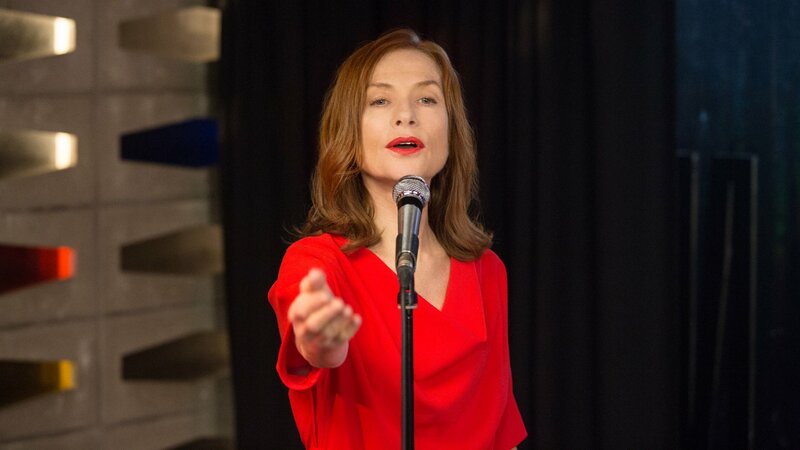 Isabelle Huppert flawlessly captures Liliane, showing that love for the stage will never fade away. It was also an absolute delight hearing her perform, as the first time when you see her wearing red to perform a song is such a feast for our eyes. In conclusion, SOUVENIR may not be one of the greatest films Isabbelle Huppert ever appeared in, but it certainly is one of the most unique and worthwhile seeing.